Positive organizations are developed by leaders who embrace a “positive organic mindset”. 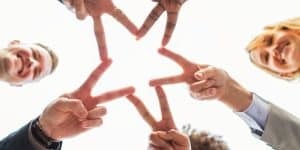 They know how to enhance Positive Awareness, Connection and Collaboration, Learning and Autonomy, and a Shared Meaningful Purpose: the four elements of a positive, productive culture! Positive does not mean “happy-bunny” but: strength-based, resilient, productive, innovative, agile, with the speed of trust. The specific contents can be customized according to your wishes. The workshop day can be designed as a complementary practice day for people who have done the online In-company Academy or the Positive Leadership Track. Without access to the online curriculum, we need to present some theory and tools before leaders can practice. This means that we can’t cover as much as when you include online access as well. It works great to combine the onsite Positive Leader Workshop with the online Positive Culture Academy. The Academy covers the theory and tools of: positive culture, culture diagnosis, and change, organizational change, positive leadership, interaction interventions, meeting interventions, change circles, personal development for influencers, and leadership practices. The curriculum is based on the research-based and practical book “Developing a Positive Culture where People and Performance Thrive“. The regular curriculum entails 22 lectures (streaming online video), downloadable checklists, a dialogue in a private group, partner work, and class conference calls. After the workshop you’ll know how to be, think, feel, and act as a Positive Leader. You have ideas of how to elevate your team and how to “walk the talk”. This workshop is for leaders up to middle management level. Marcella Bremer MScBA is an author and international consultant. She helps leaders, HR-professionals, consultants, and associates contribute to a positive workplace. Interested in the onsite Positive Leader Workshop? Let’s schedule a call to talk about your needs so we can create a proposal. Please send us an email with your details. Help your organization be (more) positive so that people and performance can thrive!